Enter the magical world of Alagaesia - and beyond . . . A stunning new collection of stories based in the world of the Inheritance Cycle, continuing the adventures of Eragon. 2.0 out of 5 starsSo unlike the others, but in a bad way. It felt like disconnected pieces of a story, the time skips and not answering questions it really opens up. I'm extremely disappointed in this book. I was really hoping to get more from this. After finishing it within an hour or so, it really wasn't worth the $11 with tax. It added basically nothing to the story line and at best serves as glorified fan-fiction sanctioned by the author. The author states in the end 'I finally managed to write a story in under 500 pages,' Well, you didn't. But two stars for effort. This isn't the quality we've come to expect from Paolini. It felt like such a rip off that I actually had to make sure I bought the right book... I hope you boot back up the series, but please... Give us a real book. 1.0 out of 5 starsDon't waste your money on this disappointment. I was excited to purchase and receive this book as I was a fan of The Inheritance Cycle from the beginning and have long desired a return to Alagaesia, but this was not that. Instead of a true fifth book we are treated to a product consisting of 3 disjointed and poorly written short stories that combined add up to about 1/3 of an actual novel. In addition to the displeasing brevity of the read, each of these stories does nothing whatsoever to progress, build upon, or add to the depth of the world Paolini has created. Instead these exercises in vanity attempt to build intrigue and depth by casting of throwaway lines in a dozen different directions without ever following up on any of them leaving only disappointment in their wake. Particularly troublesome was the second of the three stories, the majority of which reads as if it where written by a 5th grader with ADD, serving no purpose other than to infuriate the reader. Save your $11 and wait until Paolini decides to put forth a little effort before you purchase any further works from this once promising author. 2.0 out of 5 starsEragon is overworked and depressed, Oh joy! “The Fork, the Witch, and the Worm” is set in the world of Christopher Paolini's Inheritance Cycle and is centered on the struggles of an overworked and depressed Eragon as he and his fellows attempt to carve a dragon rider Academy from Mount Arngor. The 281 page count is deceptively large because the page size is only 5 x 7 inches with merely 20 short lines of text per page, making it a very small book. The only other characters to return in a significant way are Saphira, Murtagh, Angela and Elva, although a few more favorites from the Inheritance Cycle are mentioned in passing. Over a third of the book (113 pages) is devoted to an Urgal legend, “The Worm of Kulkaras”. Those readers who are looking for closure on any of the many story threads that were left hanging in the Inheritance Cycle will be disappointed. There is none and the epic story comprised by the original four books continues to stand as a cautionary tale to young writers not to bite off more than they can chew. The subtitle of the book is “Tales from Alegaësia - Volume 1: Eragon”. This implies that there will be more volumes and they will focus on other characters. Can we look forward to an Arya volume? A Roran volume? A Nasuada volume? A Jeod volume? Time will tell. However, unless the author is willing to address the unsatisfactory danglers from the original epic, these day-in-the-life-of short stories will not sooth and may add further unhappiness to the many readers who long for a proper conclusion to the original epic. 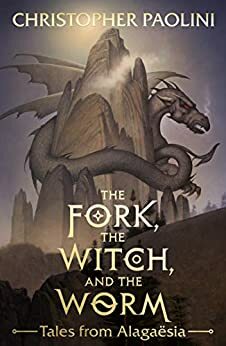 One of the most delightful features of “The Fork, the Witch, and the Worm” is the introduction of a new author, Angela Paolini. More, please! Lastly, Christopher Paolini still delights in creating hard-to-pronounce names in his make-believe languages and we see several new ones in this book. They can annoy readers who prefer to read out loud to others. The perfect word to describe this book: Meh. To diehard Eragon fans this book is a major disappointment. A lot of stories were flat and one dimensional. I think if you are looking for more of Eragon, what the tree took from Eragon, Arya, or any questions you were hoping would be answered in this past decade, you’re in for a major letdown. 3.0 out of 5 starsShort and leaves much hanging. Hopefully, this will be the opening of a 500 page continuing story of Eragon and Saphira. But it was disappointingly short leaving us hanging. Hopefully he will go back to writing fulfilling stories of his series that make sense. Looking forward to those as this is a teaser only, I am sure. It is good, but disappointing for his fans that long for the real Eragon stories.